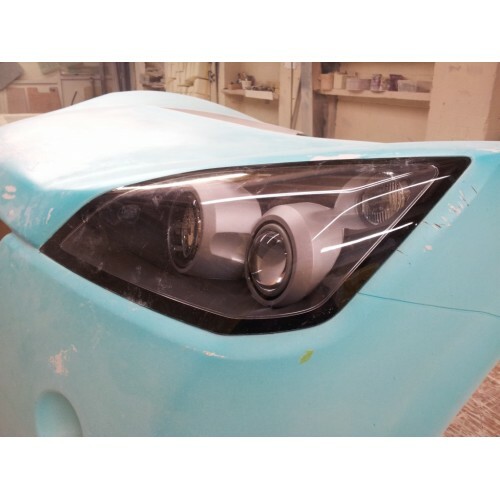 We have now developed a replacement front clamshell for the VX220 and Opel Speedster. Our intensive process for tooling of the clam molds involved not just sourcing an original clamshell but stripping back and prepping the clam. This process means that the finished reproduction requires almost no paintshop preparation as the surfaces are pre-flatted. All the holes and cutouts are done in the factory. A small amount of final fit and finishing may be required. The clam is both lighter and stronger than the original Lotus part (around 12kg against 14kg on the OEM unit). The original clams are mass produced using a “vac assist” production method which is great for making large volumes of parts but results in a weaker and heavier product. These clams are entirely made by hand by us and the difference in strength and rigidity are very noticeable. The clam is produced to a high standard and will require minor finishing prior to painting. The clam can easily be fitted by and competent DIY owner or bodyshop. When buying a clam we have an exclusive offer of adding a hardtop kit to your order for just £450 extra. If the clam is in for paint why not get the painters to spray you a brand new roof?